I have sold many of the competitors of this system over the past several years and have received the following complaints from those users. 1. The high level fill switch fails resulting in overflowing the buckets into the growing area, which as you can imagine, leads to a major cleanup. 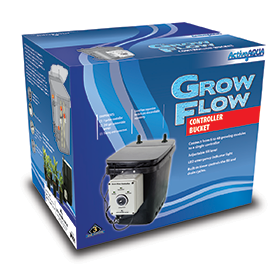 The Active Aqua Grow Flow system has a built in high level shutdown switch which prevents this from occurring with this system. 2. 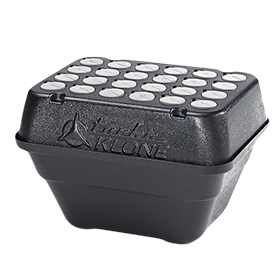 After finishing the drain cycle, standing nutrients remain in the bucket. If the plant has a reasonable root mass, they are left in the standing nutrients in the bucket. This can and often does lead to root rot. 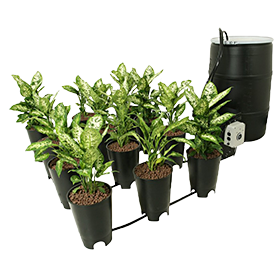 The Active Aqua Grow Flow system has specially designed buckets with legs which elevate them above the floor of the grow area which allows them to be drained from the bottom of the bucket instead of the side like the others are. 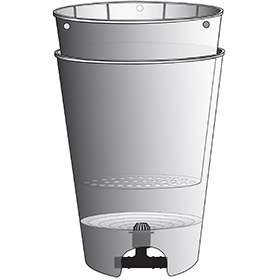 The buckets also feature a concave bottom to facilitate total drainage of the buckets. These features along with the fact that you can adjust the fill level to the desired height (the fill level is fixed on the competitors), set this unit above the competition.